Monsoon Watch -3... 2016 (Additional)...May 5th 2016. The arrival date is calculated seeing today's position.Further from today, we presume the normal rate of progress.This initial estimated dates are subject to some changes, and will be finalised around mid-May, when the puzzle pieces get better arranged. Arabian Sea Branch: Though there is some improvement in some of the parameters, there is still much to be achieved, and most parameters are still lagging behind time, and are -ve. The Arabian Sea branch, now affected by the temporary "dis-organisation " in the equatorial winds at the equator, can recover provided the winds regroup fast. On these calculations, Vagaries would maintain the Monsoon to reach Maldives around the 24th of May 2016 (20th May), Sri Lanka around 27th/28th of May (25th May). Kerala by the 4th/5th June (1st June). Hence, maintaining and presuming the normal rate of progress, Goa should get Monsoon rains by around 10th June (5th June). NE States can also see Monsoon resume around that date. Mumbai by 13th/14th June (9th June). Pre Monsoon thunder showers could start from around 7th/8th June 2016. Bay Branch: A Western Disturbance (M-1) is active the Northern regions of the sub continent, and will gain strength by the 5th and 6th. Back to back, we may see M-2 around 12th May...if it happens, may lead to a delay the formations of any Low in the Bay. Bay branch needs to wait a few days for the the pulses from the East in the Bay to resume for Low formations. SWM should hit South Andaman Sea around 17th.May (12th May), and rest Andaman Islands by 20th May 2016. Generally moves up (normally) the Bay at a sustained speed, and Kolkata should see Monsoon arrival by the 11th/12th of June. We stop at this initial progress, and work out further region wise progress at a later date (as is the usual practise in Vagaries' MWs). Awesome work Sir & feeling proud that we Vagarians are able to learn SWM unfolding from you.. :) Vagaries is first to announce (estimate) onset date for Andaman islands & mainland Kerala as its the gateway for India and further till commercial captial Mumbai.. Awesome work and so proud sharing weather experince with you.hope ur estimate may be true.i have one question. Some international module predicted low or DD formation in central arabian sea or it may be 1st cyclone of the season.it to early to comment but your view on that.. Thanks for the updates Sir. So we are looking at a delayed onset likely. Dont think we are going to see any impact on precipitation pattern because of the delayed onset. Fingers crossed. Always learning so much from your Monsoon Watch series. Looking forward to the Monsoons as they unfold through your blog! Any contest for arrival dates in Mumbai sir? 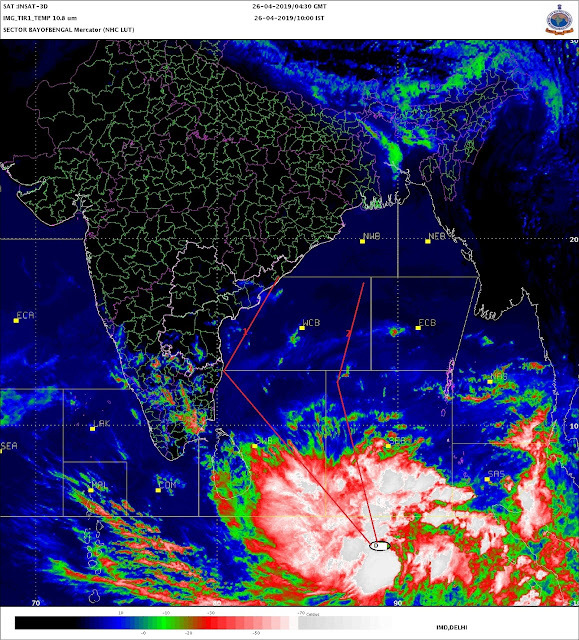 Cyclones in last week of May in Arabian Sea are not rare...lets see. Monsoon date arrival contest will not be practical, as we know the window for arrival date in Kerala is very small. Sorry to deviate sir , but you said that madhya maharshtra will see rains between 4th-6th of may , but weather here was clear and dry . when can we expect rain as this region is missing action while entire country is receiving rainfall. Karan: Rains have eluded South Madhya Mah.Kalwan, Dindori, Niphad talukas of nashik district recorded hailstorm yesterday.Vidharbh got rains. Int Karnataka also got good rains . Bangalore 46 mms.